Your order will ship MONDAY if placed in the next 20 hours 56 minutes . Enter your shipping address zip code to receive an instant delivery date estimate from UPS. Fiocchi Extrema 223 Remington 50 Grain Hornady V-Max ammo for sale online at cheap discount prices with free shipping available on bulk 223 Remington ammunition only at our online store TargetSportsUSA.com. 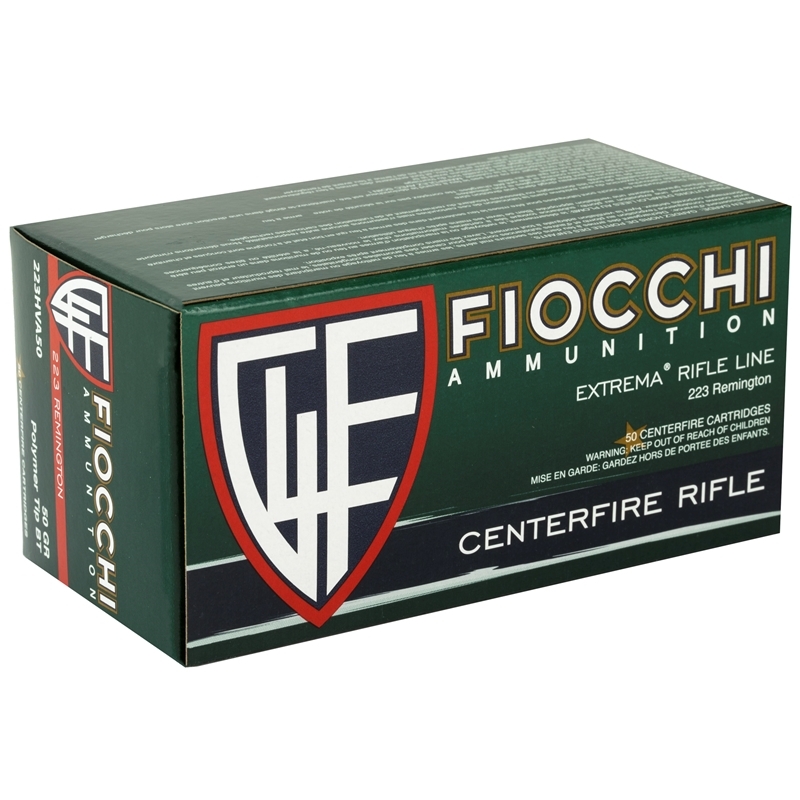 Target Sports USA carries the entire line of Fiocchi Extrema ammunition for sale online with free shipping on bulk ammo including this Fiocchi Extrema 223 Remington 50 Grain Hornady V-Max. Fiocchi Extrema 223 Remington 50 Grain Hornady V-Max ammo review: Produced with precision cases and reliable Fiocchi primers, this ammunition is new production, non-corrosive, in boxer-primed, reloadable brass cases. Hornady's V-Max Bullets feature a polymer tip which enhances accuracy and promotes devastating expansion. The tip raises the ballistic coefficient for faster velocity and helps to stabilize the bullet in flight. It also acts as a wedge, initiating bullet expansion. The copper jacket provides the necessary bearing surface for maximum stability out of the barrel, and the jacket is built to withstand the fast twist rates of the most advanced varmint rifles. Hornady's V-Max Bullets feature a polymer tip which enhances accuracy and promotes devastating expansion. The tip raises the ballistic coefficient for faster velocity and helps to stabilize the bullet in flight. It also acts as a wedge, initiating bullet expansion. The copper jacket provides the necessary bearing surface for maximum stability out of the barrel, and the jacket is built to withstand the fast twist rates of the most advanced varmint rifles. Muzzle Energy 1208 ft. lbs. Good stuff from a quality company. Target Sports makes them affordable. I bought a variety of ammo to try and this stuff groups the best in my 1 in 7" twist barrel. The V-Max bullet is deadly on predators. Very accurate, great round for prairie dogs. Killed prairie dogs out to 450 yds. 26 inch barrel, 1/12 twist. Very accurate ammo! One of my most accurate rounds in my AR & tikka. Its my favorite for coyotes and praire dogs or just target shootine. Fiocchi Ammo for sale online at Target Sports USA. Fiocchi ammunition has been manufacturing a wide range of ammunition calibers for over 100 years. TargetSportsUSA.com carries the entire line of Fiocchi ammo including Fiocchi Shooting Dynamics ammo, Fiocchi Extrema ammo, Fiocchi Cowboy Action ammo and many other lines in shotgun & rimfire ammunition. Shooting Dynamics ammo made by Fiocchi is designed for target & practice shooting for those high volume shooters that demand the best quality high pressure ammo at a reasonable price point. Target Sports USA has Fiocchi Shooting Dynamics 9mm ammo, Fiocchi 380 ACP, Fiocchi 45 ACP AUTO ammo and many other popular ammo calibers for sale online with free shipping on bulk. Order any case of Fiocchi Shooting Dynamics bulk ammo, free shipping is included. In addition to Fiocchi Shooting Dynamics ammo, Fiocchi offers a ammo line called Fiocchi Extrema for hunters and small game. To provide hunters with one of the best-performing lines of ammunition available, Fiocchi combines precision drawn cases and their reliable primers with the V-Max bullets. Fiocchi has chosen these bullet types as all of them have a long standing reputation for excellent performance. The Extrema rifle ammunition uses only the best, carefully selected powders to ensure these cartridges achieve results that will make the Extrema a favorite of hunters worldwide.